There are four seasons to every year Winter, Spring, Summer, and Football. Yay! Football season is upon us and we are all super stoked because that means it is tailgating season! We may be biased but we believe Navy Football tailgating is some of the best in the country. Haven’t been? New to tailgating? Looking to step up your game day revelry? 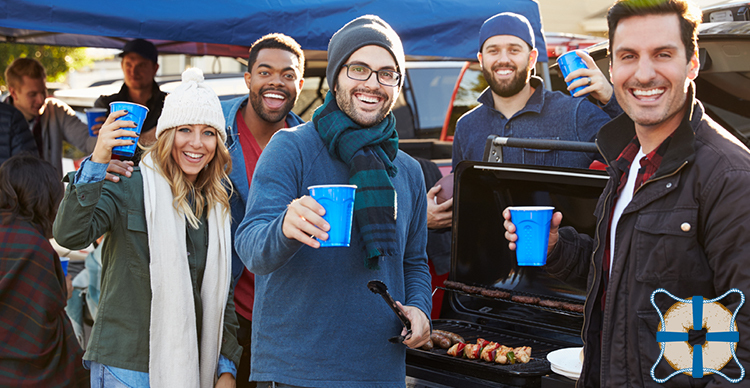 We have got some tailgating tips to take your festivities to the next level. First things first…Navy gear is a must. Show your team pride by sporting navy and gold. Release your inner super-fan with team-themed threads. Fear the Goat! This combination of accessories sets up your tailgating area. A tent or a canopy is a must for the ultimate set up for so many reasons. Especially because it protects your burgers and beverages from the sun and not-so-great weather. Camping chairs are convenient and comfortable options for you and your guests. A folding table is a necessity for setting up a buffet and organizing paper goods like plates and napkins, etc. Don’t forget a team-themed tablecloth! Also, you may want to pack bungee cords and duct tape to secure everything. Who goes to a tailgate party without a cooler, right? Seems like a no-brainer. However, you can upgrade your beverage station by making sure you have ample ice as well as themed koozies, bottle openers, corkscrews, and insulated tumblers. Consider labeling coolers clearly for convenience. Use separate coolers for meat and adult or non-alcoholic beverages. A grill is the quintessential tailgating accessory. No need to haul your huge family grill though. There are many models made specifically for travel/tailgating, in a wide price range for any budget. Remember to pack grilling essentials like tongs, flippers, pot holders, lighter, etc. Think outside the box when cooking up something delicious. Perhaps try grilled pizza bagels or a scrumptious New York Bagel Burger. We suggest you pick up plenty of Naval Bagels and challenge your friends to a cookoff! Click here for all the details about the grilling regulations at the Navy-Marine Corps Memorial Stadium. Who doesn’t love a sloppy burger or a stacked hotdog? So, make sure you have plenty of napkins, paper towels, and wet wipes for you and your guests. Additionally, pack hearty paper plates for those monster burgers and dogs and hearty side dishes. Last, but not least, remember the plastic cups (a tailgating staple). As kickoff time approaches make clean up a breeze. Bring plenty of plastic food storage containers and aluminum foil to easily pack up food before heading into the game. Use a permanent marker to label everything. Organize and reset your area, especially if you plan to also head out during half-time. Bring hand sanitizer, wet wipes, trash bags, paper towels, extra tablecloths to make cleanup simple and quick. Plus keep extra garbage bags handy. They double as ponchos, and while “navy and gold don’t run” it’s still nice not sitting around in soggy clothes if you can help it, right? Champions don’t show up to get everything they want, they show up to give everything they have. Sailor or Power Boater? Are They Really All That Different?